Enrique Winter, Suns, Trans. by Ellen Jones, David McLoughlin, and Mary Ellen Stitt, Cardboard House Press, 2017. 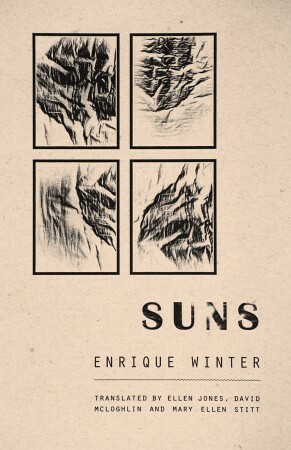 A brief plaquette, Suns compiles poetry from different parts of the career of Enrique Winter, one of the most prominent Chilean poets of his generation. Winter is interested in relationships — between people, between objects, between people and objects. The usual proportions between the individual parts are altered, so that ordinary objects are capable of sustaining realities larger than themselves. “In the coffee a cup floats / he tried to see it like they saw it,” Winter writes; he notes “a tricycle wheel holding up the traffic.” Experiences and overheard fragments of phrases read almost like prose. At what point do such constitutive elements transform into a poem? “When does that drawing / begin to be a cat?” The question of the relationship between the ephemeral and the enduring seems to be at the center of Winter’s aesthetic. Enrique Winter, Sign Tongue, Trans. by David McLoghlin, Goodmorning Menageries, 2015. Enrique Winter (Santiago, Chile, 1982) is the author of Atar las naves (winner of the Víctor Jara Arts Festival), Rascacielos (awarded the National Book Council fellowship) and Guía de despacho (winner of the National Young Poet Competition) and co-author of “Agua en polvo” (awarded the Fund for the Promotion of Chilean Music fellowship), collected in Primer movimiento. He is also translator of Blanco inmóvil, by Charles Bernstein, and co-translator of Decepciones, by Philip Larkin. He served as editor of Ediciones del Temple for eight years prior to entering NYU’s creative writing program in Spanish.